As the song says, it’s the most wonderful time of the year. But for some seniors, this season can be stressful. The holiday season is full of traditions and memories that can trigger emotions, even loneliness. It’s up to caregivers to lift the spirits of our seniors and help remember the good times while creating new memories that can be thought upon for years to come. At Stillwater Senior Living, we are getting in the spirit of the season in much the same way families here in Edwardsville, IL do. We encourage our residents to get involved in the many holiday activities that are happening between now and the end of the year. Time with friends, family and neighbors is really the reason for the season. It can be the best medicine for beating stress and confusion that can be brought on by the holidays. The following are some tips that will help you to help your loved one get into the holiday spirit and enjoy the season. One of the best ways to get your loved ones in the holiday spirit is to encourage them to decorate their personal living space. Bring them some special ornaments to hang on their own personal tree. Having grandchildren assist in the decorating can create special memories while making their living space cozy and warm. Seniors often have special recipes that they have passed down to loved ones. Why not include them in the baking and cooking process? They would find a lot of joy in assisting their grandchildren with baking those special Christmas cookies and decorating them. 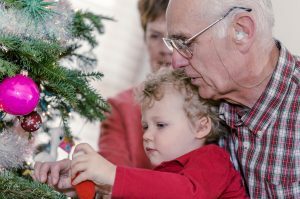 Encourage your loved one to talk about loved ones from their past and share their stories of Christmases past. It can help lift their spirits and keep them feeling happy the whole season long. Look at old photo albums, home movies, and listen to holiday music to help bring back memories of happy holiday memories of the past. Get a box of holiday cards and have your loved one help you address them. Keeping in touch with friends and family during the holiday season can bring your loved one lots of joy. They will also have joy when they get cards in return from family and friends across the country. Take your loved one on a shopping trip. They can buy gifts for their friends and loved ones. The sun during the day will do them so good. Seniors that get out in the sunlight are less likely to suffer from seasonal affective disorder. At night, take them on a drive to look at Christmas lights. If it’s cold outside, bring along a thermos of hot chocolate to keep them warm. A blanket might be a good idea as well. Holidays are built upon tradition. They strengthen the bonds with our loved ones. They influence our mood and bring us joy. These traditions are meant to be forever. Here at Stillwater Senior Living, we encourage our residents to keep family traditions alive and share them with other residents.